Divider exception code, used by vectored exception handler. Debug exception code, used by vectored exception handler. Bound range exceeded exception code, used by vectored exception handler. Illegal instruction exception code, used by vectored exception handler. Access violation exception code, used by vectored exception handler. Page fault exception code, used by vectored exception handler. x87 floating point exception code, used by vectored exception handler. Alignment check exception code, used by vectored exception handler. SIMD floating point exception code, used by vectored exception handler. Unknown exception code, used by vectored exception handler. Hardware exception flag, set when enclave software exited due to hardware exception. Software exception flag, set when enclave software exited due to software exception. 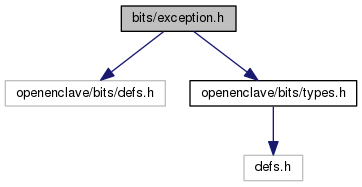 This file defines data structures to set up vectored exception handlers in the enclave.